Palestinians and left-wing activists protested near the Beit Romano checkpoint in Hebron on Saturday against the Nahal Brigade soldiers who broke into dance while patrolling the West Bank city. The clip showing six soldiers in full gear performing a mock dance to the tune of the global hit Tick Tock received no less than three million hits on YouTube. On Wednesday Colonel Amir Abulafia, commander of the Benjamin Brigade, summoned two of the soldiers who participated in the IDF dance video. Abulafia told the two squad commanders that they acted inappropriately by participating in the video while donning their uniform, armor and weapon – but because their behavior did not display any moral flaws, he decided to give them an educational assignment: The two will star in an educational IDF video that will attempt to prevent similar incidents in the future. Aside from the two officers, all other "dancers" from Battalion 50 are already on vacation leave, as they are due to be released from the military in a few days. 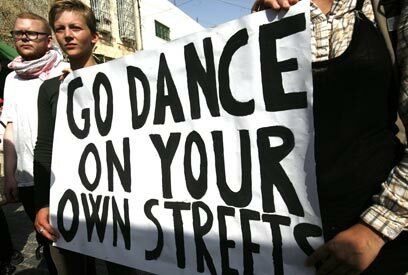 See all talkbacks "Hebron Palestinians: Go dance on your own streets"